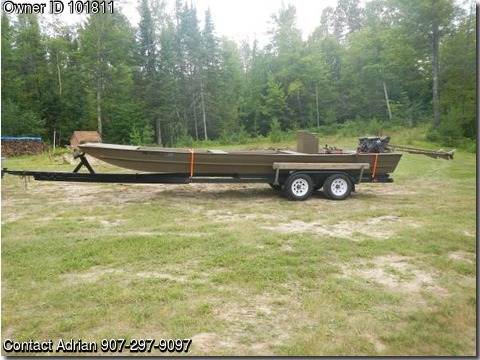 Boat is located in Grand Rapids,Minnesota..Please contact the owner @ 907-297-9097...Moved out of Alaska a couple years ago, used this for moose hunting on the Tanana River. I would put a 14' boat upside down up front and still have plenty of room. Would make an excellent big water duck boat. Boat is light and floats very high and is surprisingly good on gas. Gets about 22 mph wide open. Boat: 24' long and 5'10" wide at it's widest point. Motors: Go-Devil's, 23 HP each. Keep in mind this this sat for most of it's life waiting for it's one trip a year. Does have permanent MN registration. Floor: Bran new, made with marine grade plywood. 3 removable sections. Transom: Reinforced with heavy aluminum. The back plate actually came from a sailboat keel! Bottom: Coated with WETLANDER bottom coating. Can't unhook boat before you are ready for it to be off the trailer and in the water. When I work it is 14 hour nightshifts so I may take a day to get back to you. Parked in front of Ben's Bait in Grand Rapids,MN.